Apple has blamed "external factors" for a handful of iPhone battery "fires" in China. The regulator refers to combustion and smoking, but it is not clear whether flames were seen. 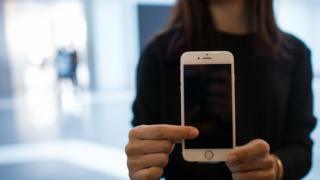 Apple has denied that it was slow to respond to consumer complaints raised by the state-run Shanghai Consumer Council. 'We treat safety as a top priority and have found no cause for concern with these products,' the company added. Xiaohan Tay, technology analyst for IDC in Beijing, said: "From what we are seeing in the market, it doesn't seem to be a big problem yet in China, we can't confirm whether all iPhone 6 and 6S models are at risk." "At this point, it doesn't seem that there is any major implication yet for the iPhones sold outside of China," she told the BBC. However, complaints against Apple have surged in the past two months according to the Shanghai Consumer Council. They include reports of sudden shutdowns of the iPhone 6 and 6S - even though batteries still had enough power. Apple last month offered to change iPhone 6S batteries for Chinese users who complained of the sudden shutdowns. But it has maintained that the problem did not constitute a safety issue. The firm has seen Chinese sales fall over the past three quarters following rising competition with domestic smartphone makers offering cheaper models. Those domestic handset makers are likely to have received a boost after South Korea's Samsung Electronics recalled 2.5 million Note 7 handsets globally following a series of battery fires. Analysts say those problems have not only damaged Samsung's reputation but have raised distrust of foreign smartphone brands in China.